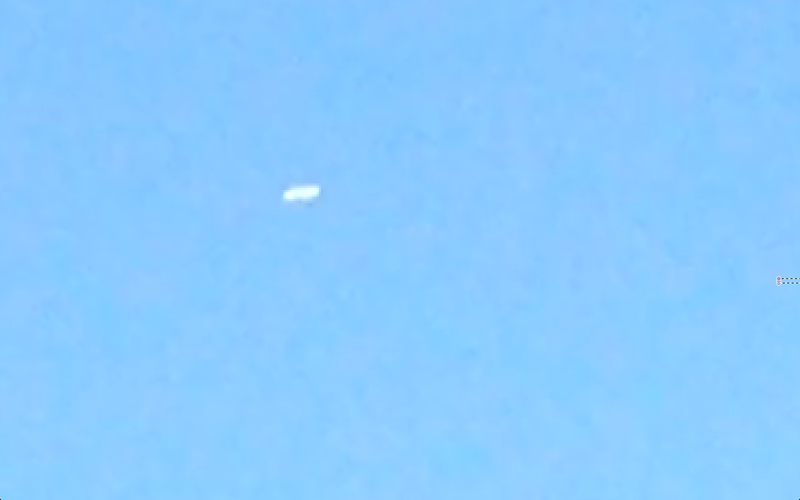 Would like you thoughts on what on earth this object and lights are filmed out to sea over Buenos Aires Argentina 14th Jan 2014 ? Any ideas? Please reply to this post. Filmers comments: About 21hs Day 14/01/14 could see this from the coast of Monte Hermoso. Searching the Internet, it is called a meteorite in Buenos Aires on 12/01, one in Saltillo, Mexico and San Antonio, Texas on 11/01. Be the same? Filmers comments: Thanksgiving evening, 2013. My five-year-old son caught a glimpse of these bright orange orbs appearing out over the ocean, from our home on Cook Inlet, Alaska. They lasted for several minutes--long enough for me to get the camera. Thought they might be particles from Comet ISON. At first, there were about a dozen of these strange lights... the smaller orbs moved into the larger ones, as though they were being, "drawn in" to them. Still not certain what they were... but, fascinating! This is an incredible new piece of UFO news about a recent near miss of a UFO with a passenger airliner. The article highlights one of the main reasons why airlines keep UFO reports under the wraps and shun pilots who come forward - being that UFO's pose a threat to secure airspace and the safety of commercial aircraft. The encounter, over Reading, Berks, was reported to the aviation authorities, who launched an investigation. But no earthly identity for the object could be established. The encounter was disclosed earlier this month by the Telegraph, following the publication of a report into the inquiry. 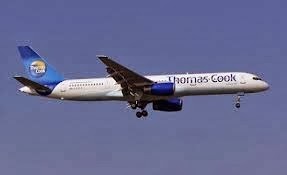 The document did not identify the aircraft involved. It adds: “The Captain was fully expecting to experience some kind of impact with a conflicting aircraft.” He told investigators he believes the object passes “within a few feet” above the jet. He described it as being “cigar/rugby ball like” in shape, bright silver and apparently “metallic” in construction. Once he had composed himself, he checked the aircraft’s instruments and contacted air traffic controllers to report the incident. However, there was no sign of the mystery craft. The incident was investigated by the UK Airprox Board, which studies “near misses” involving aircraft in British airspace. A startled couple where shocked to witness a bright disc come from the sea and ascending slowly over Boca beach, south Pavillion Florida. Filmers comments: Here are some photos and stills from a video I took of my 'sighting' on 16.01.14 - on the train from Edinburgh to London Kings Cross. The sighting occurred just outside North Berwick on the east coast line. 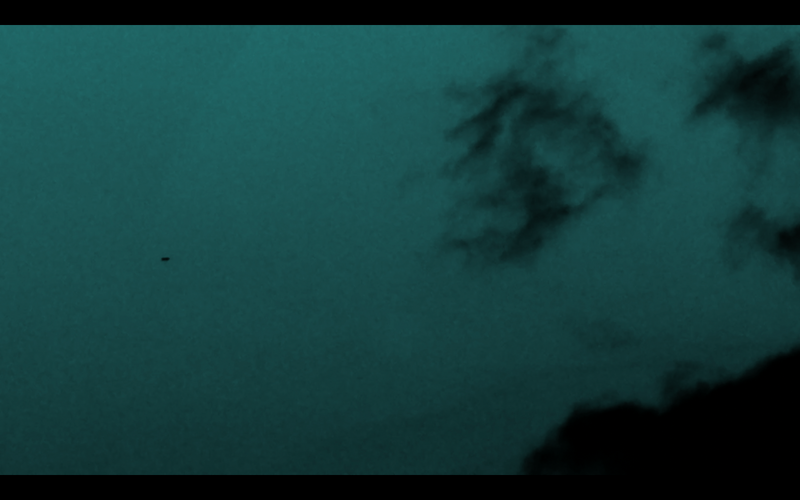 I have supplied an 'xray version' of a still from my video too. I'd be really keen to hear of anyone else that happened to see these objects on 16.01.14. Please disregard objects in foreground at the start and look at background. This video is rather interesting. Over the years I have seen so many similar videos - I'm still not sure why these Orbs are so attracted to jet trails? Your comments appreciated. This object was filmed near an airplane above Tijuana, Mexico. The UFO sighting begins approx 1:40 into the video. Report: About one minute, and 40 seconds in is when the lights I am talking about begin. I suddenly felt the urge to go outside. I asked my wife to get the night vision video equipment. I went outside and looked to the north. The moon was full. Little or no wind. Clear for the most part. I witnessed an orange sphere that de materialized from sight. My wife came out and we were both looking north. I began video taping the event and scanning the northern sky. We then noticed some bright flashing lights to the north. Three at first. Then right behind the three flashing lights, we spotted an orange sphere. It was followed by a smaller red light or sphere. That was followed by another flashing light. The flashing lights were noticeably smaller than the larger orange and slightly smaller red spheres. They were proceeding slowly to the west. The duration of the event was about 10 and a half minutes of video. Straight line path. 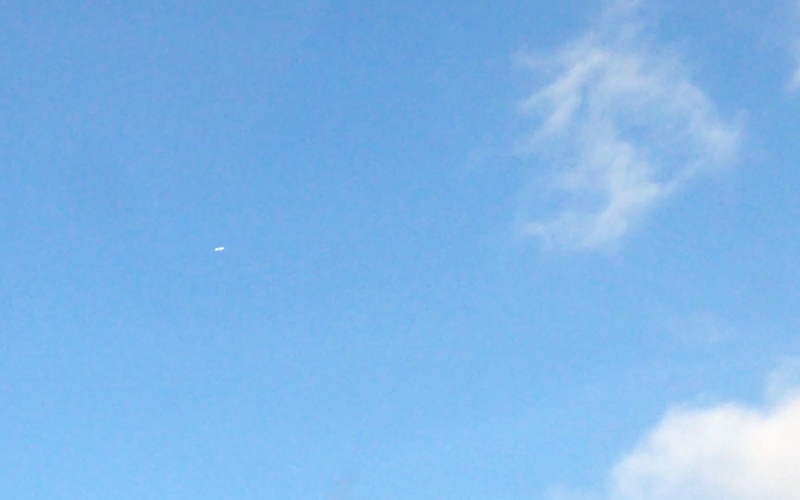 They flew behind some clouds but I continued the video until they became visible again. The distance was pretty far, but the orange sphere was about the size of an aspirin. Clearly round. Very excited to have it on video at last. We lost sight of the objects due to trees to our west. Also, there has been a good amount of military aircraft in the skies this evening. More than usual. My wife and I were watching television on the evening of Wednesday, January 15th. It was 7:45 pm. I suddenly felt the urge to go outside. I got up, put my jacket on hurriedly and asked my wife to get the night vision video equipment and follow me out. That was strange because I have never asked her to do anything like that in the manner I did. I went outside and looked to the north. The moon was full. Little or no wind. Clear for the most part. I witnessed an orange sphere that de materialized from sight. It faded from view where I spotted it. My wife came out and we were both looking north. I began video taping the event where I saw the orange sphere disappear and also began scanning the northern sky when I didn't see anything of what I was looking for. We were using a battery powered Newton Hornet Monocular that multiplies by four what could be seen using the naked eye. We initially noticed three or four military aircraft in the general vicinity of due north. As I scanned the sky eastward, yet still north of our viewpoint, we then noticed some bright flashing lights to the north. (I thru the Monocular and Audrey viewing the attached screen. Three at first. Then right behind the three flashing lights, we spotted an orange sphere. It was followed by a smaller red light or sphere. Those could be seen with the naked eye. That was followed by another flashing light. The flashing lights were noticeably smaller than the larger orange and slightly smaller red spheres and only visible via the Monocular and digital receiver. They were proceeding slowly to the west. The duration of the event was about 10 and a half minutes of video. Straight line path. 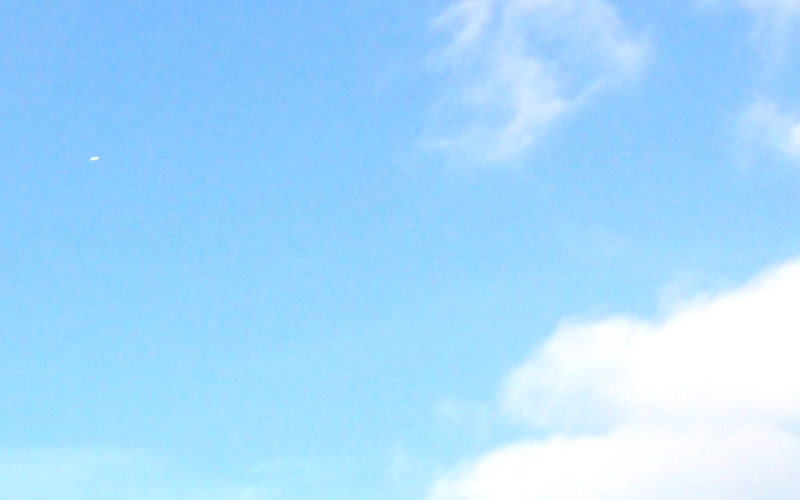 They flew behind some clouds but I continued the video until they became visible again. A military jet was first out of the cloud. It was not near the lights when the lights went behind the cloud. The distance was pretty far, but the orange sphere was about the size of an aspirin before we lost sight of it behind the cloud. The orange and red spheres were clearly round. Very excited to have it on video at last. We lost sight of the objects due to trees to our west but as you can see in the video, there was plenty of activity while viewing the trees. Also, there has been a good amount of military aircraft in the skies this evening when finally scanning east after we lost sight of the lights. More than usual. The video is about 11 minutes in length, but please watch the whole thing. It goes behind a cloud for about a minute and a half. Also, if the six light are one object, we are talking about an object over 5 miles in length. Let me know what you think. Thanks! Looking closely at this footage, you will see two parallel Orbs filmed under night vision. Could these simply be fast moving birds, or do birds not fly at this altitude? Your comments appreciated. Mark McCandlish is an accomplished aerospace illustrator and has worked for many of the top aerospace corporations in the United States. His colleague, Brad Sorenson, with whom he studied, has been inside a facility at Norton Air Force Base, where he witnessed alien reproduction vehicles, or ARVs, that were fully operational and hovering. In his testimony, you will learn that the US not only has operational antigravity propulsion devices, but we have had them for many, many years and they have been developed through the study, in part, of extraterrestrial vehicles over the past fifty years. In addition, we have the drawing from aerospace inventor Brad Sorenson of the devices that he saw, as well as a schematic of one of these alien reproduction vehicles -- in some remarkable detail. A group of fiery colored, bright objects (UFOs) above Harrow, London UK.